Critical Data Centre Cooling: The increasing demand for energy efficiency in the pursuit of business continuity. We recommended the installation of air intake screens. 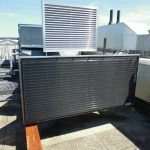 Designed to fix over external intakes on AHUs, chillers, condenser units and cooling towers, air intake screens have minimal impact upon airflow whilst offering excellent filtration qualities.